i rather liked this one. great house track. I really loved this one!! very awesome! Another great demo at a great democompo. Loved the letters part. It has its good parts, but i think this demo is stretched out way to much...kinda losing my patience so a piggie face. pure love, yes. the compos big surprise. liked the effects, mood and flow. minor quibbles: font (and the unnecessary scene poetry displayed with it :) and most scenes were shown a tad too long. but still, nice demo. "(and the unnecessary scene poetry displayed with it :)"
Top knotch stuff, and I liked the length; I wasn't sure if it would end, and then it didn't, and then it didn't; and then I didn't want it to. Very good. Music could have been more interesting though. a bit rough on the edges (too long, somehow messy, not enough syncs to the music) but still one of my favourites from the compo. great effects! The exploding stuff were cool. Best Adapt demo so far, great effects which seem to be a bit inspired by the mighty ASD, while the exploding lines in the tunnel remind me on Debris. A bit too long, but very good overall. oh yes. hypnotic, drifty, menacing, psychedelic - yet eerily very relaxed at the same time. well done. Trippy - enjoyed it very much indeed :) Excellent entry, keep it up Adapt! 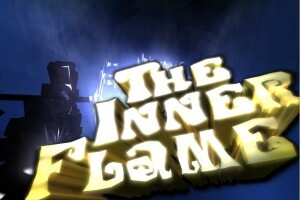 The Inner Flame is a nice demo. Excellent soundtrack but the demo is too long. It looked also much better on the stream. The low poly count and the few graphic glitches are obvious on my machine. Also, I remember thinking "arg, unix design coming up" when seeing "made with gimp" on the stream but it turned out to be well designed. More polishing would have turned it into one of the best demos of the compo imo. For me this demo has the same problem as most demos at Assembly 2007 - it´s just too boring, no new ideas and no spectacular effects. So a piggy for now but I think this group has quite a lot of potential - improved direction and a bit more polish would lead to great true winner demos. i like it - way too long, but nice effects and colors combined with an enjoyable soundtrack. underrated! Really nice track. But as mentioned, too messy and abit too long maybe. rulez added on the 2007-08-08 16:18:42 by chenmy! excellent enjoyable graphics, should have be ranked higher! only minus point if i may : the text font is subpar compared to the gfx. Wow! Tons of really high-quality effects. These days, though, effects along aren't enough to make a really first-class demo. You need design and flow, which this demo is a tiny bit weak on. Still, thumb up for the music and effects alone. Should have been ranked higher. Cool demo - if a little long at times. Cheers! i think it could do better than usual pig ;>, reminds me late 90's era on a1200. the track is sleeepy. Great tune, nice chillout demo. just wondering why it got ranked so low? it's a pretty good show with cool soundtrack. page created in 0.023936 seconds with 15 queries.